This is a continuation application of U.S. application Ser. No. 10/460,016, filed Jun. 11, 2003 now U.S. Pat. No. 7,186,789, the teaching of which is incorporated herein in its entirety by reference. Langer et al. have published a type of bioabsorbable, polyester polymer that they have dubbed “Biorubber”. (Nature Biotechnology, vol. 20, p. 602, Jun. 2002) This polymer is a polyester copolymer composed of sebacic acid and glycerol. It is a crosslinked elastomer, but possesses no biobeneficial or bioactive moieties. Improved polymers with non-fouling surfaces or with biobeneficial surfaces remain a goal in this art. The diol, triol, or polyol component is a chain with one or more alcohol functionalities. In some embodiments this component is a mixture of di- or multi-alcoholic molecules such as mixtures with PEG diols, glycerol, other triols, etc. In some embodiments, this component is a mixture comprising PEG diols, PLURONIC(TM) diols, or glycerol or other triols. Biobeneficial moieties that are primarily non-fouling are poly(ethylene glycol), polypropylene glycol, PLURONIC(TM) surfactants—block copolymers of polyethylene glycol and polypropylene glycol, hydroxy functional poly(vinyl pyrrolidone) dextran, dextrin, sodium hyaluronate, hyaluronic acid, elastin, chitosan, water-soluble chitosan, water-soluble heparin, water-soluble elastin, tropoelastin, Albumin, and poly(2-hydroxyethyl methylmethacrylate). Biobeneficial moieties that are primarily hemocompatible are heparin, hirudin, and sulfonated polystyrene. Particular bioactive agents would include superoxide dismutase mimetics, anti-oxidants, and free radical scavengers. Biobeneficial moieties can possess a combination of these or other properties. 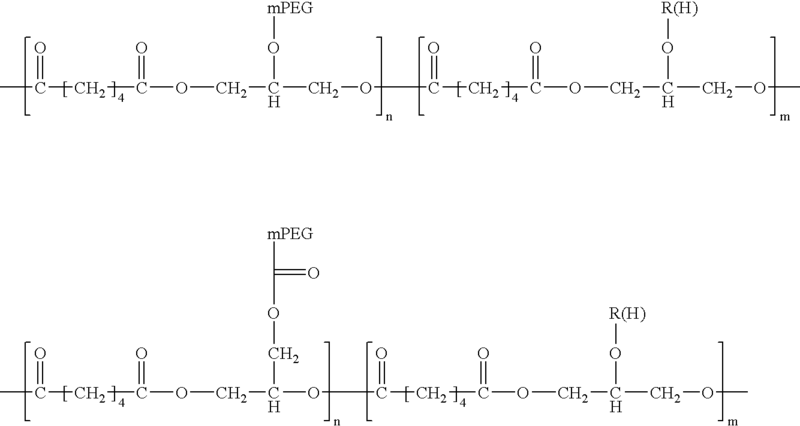 The reactivities of PEG300 and glycerol are quite different, so it is advantageous to produce this polymer in a two-step process. Generally, one equivalent of PEG300 is combined with two equivalents of sebacic acid. This is heated under vacuum to produce a sebacic-acid-terminated PEG300. Useful reaction temperatures range from 80 to 140° C., under vacuum of 10 mtorr to 760 torr. Then, depending on the n:m target ratio and the final molecular weight desired in the copolymer, an additional amount of sebacic acid and glycerol, in a 1:1 mole ratio, is added, and the reaction is continued. Useful reaction parameters in this step include reaction temperatures of from 80 to 140° C., under pressures of 10 mtorr to 760 torr, for reaction times of 2-48 hours. 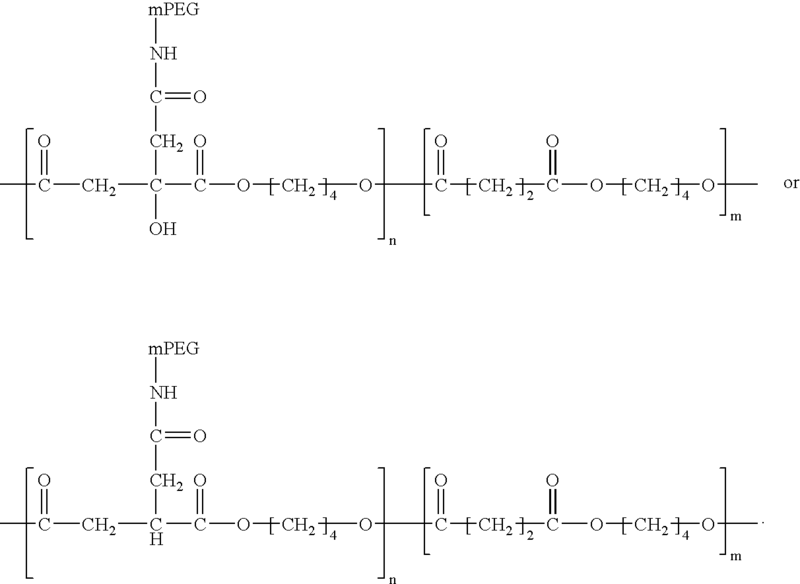 Another specific embodiment of the invention copolymers is a grafted terpolymer of tricarballylic acid, succinic acid, 1,4-butanediol and the monomethyl ether of polyethylene glycol MW=600 (mPEG600). Again, one method of making this polymer is a two-step process where the mPEG is reacted first due to its lower reactivity. Generally, the mPEG is coupled to the tricarballylic acid by coupling an amine-terminated M-PEG (such as available from Nektar, formerly Shearwater Polymers) to tricarballylic acid via carbodiimide chemistry. This mPEG-derivatized diacid is then combined with the desired amount of 1,4-butanediol and succinic acid in a 1:1 mole ratio. Instead of ester formation via dehydration using heat and vacuum, further addition of an appropriate carbodiimide, such as 1-(3-dimethylaminopropyl)-3-ethylcarbodiimide hydrochloride (EDC) or 1,3-dicyclohexylcarbodiimide (DCC), will couple the carboxylic acid and hydroxyl groups to form the polyester. In some embodiments, this yields a linear polymer that is solvent soluble and amenable to current stent coating processes. The therapeutic agent can be for inhibiting the activity of vascular smooth muscle cells. More specifically, the therapeutic agent can be aimed at inhibiting abnormal or inappropriate migration or proliferation of smooth muscle cells to prevent, inhibit, reduce, or treat restenosis. The therapeutic agent can also includeactive agent may be any substance capable of exerting a therapeutic or prophylactic effect in the practice of the present invention. Examples of such active agents include antiproliferative, antineoplastic, antiinflammatory, antiplatelet, anticoagulant, antifibrin, antithrombin, antimitotic, antibiotic, and antioxidant substances as well as combinations thereof. An example of an antiproliferative substance is actinomycin D, or derivatives and analogs thereof (manufactured by Sigma-Aldrich 1001 West Saint Paul Avenue, Milwaukee, Wisc. 53233; or COSMEGEN available from Merck). Synonyms of actinomycin D include dactinomycin, actinomycin IV, actinomycin I1, actinomycin X1, and actinomycin C1. Examples of antineoplastics include paclitaxel and docetaxel. Examples of antiplatelets, anticoagulants, antifibrins, and antithrombins include aspirin, sodium heparin, low molecular weight heparin, hirudin, argatroban, forskolin, vapiprost, prostacyclin and prostacyclin analogs, dextran, D-phe-pro-arg-chloromethylketone (synthetic antithrombin), dipyridamole, glycoprotein IIb/IIIa platelet membrane receptor antagonist, recombinant hirudin, thrombin inhibitor (available from Biogen), and 7E-3B® (an antiplatelet drug from Centocor). Examples of antimitotic agents include methotrexate, azathioprine, vincristine, vinblastine, fluorouracil, adriamycin, and mutamycin. Examples of cytostatic or antiproliferative agents include angiopeptin (a somatostatin analog from Ibsen), angiotensin converting enzyme inhibitors such as CAPTOPRIL (available from Squibb), CILAZAPRIL (available from Hoffman-LaRoche), or LISINOPRIL (available from Merck & Co., Whitehouse Station, N.J.), calcium channel blockers (such as Nifedipine), colchicine, fibroblast growth factor (FGF) antagonists, histamine antagonist, LOVASTATIN (an inhibitor of HMG-CoA reductase, a cholesterol lowering drug from Merck &Co.), monoclonal antibodies (such as PDGF receptors), nitroprusside, phosphodiesterase inhibitors, prostaglandin inhibitor (available form Glazo), Seramin (a PDGF antagonist), serotonin blockers, thioprotease inhibitors, triazolopyrimidine (a PDGF antagonist), and nitric oxide. Other therapeutic substances or agents that may be appropriate include alpha-interferon, genetically engineered epithelial cells, dexamethasone, estradiol, clobetasol propionate, cisplatin, insulin sensitizers, receptor tyrosine kinase inhibitors and carboplatin. Exposure of the composition to the active agent should not adversely alter the active agent's composition or characteristic. Accordingly, the particular active agent is selected for compatibility with the blended composition. Rapamycin is a suitable active agent. Additionally, 40-O-(2-hydroxy)ethyl-rapamycin, or a functional analog or structural derivative thereof, is suitable, as well. Examples of analogs or derivatives of 40-O-(2-hydroxy)ethyl-rapamycin include but are not limited to 40-O-(3-hydroxy)propyl-rapamycin and 40-O-[2-(2-hydroxy)ethoxy]ethyl-rapamycin. The release rate active agents, such as 40-O-(2-hydroxy)ethyl-rapamycin, can be advantageously controlled by various methods and coatings as is known in the art. As stated above, invention block copolymers can be used with other polymers and biopolymers. Representative examples of polymers useful with invention block copolymers include ethylene vinyl alcohol copolymer, poly(hydroxyvalerate); poly(L-lactic acid); polycaprolactone; poly(lactide-co-glycolide); poly(hydroxybutyrate); poly(hydroxybutyrate-co-valerate); polydioxanone; polyorthoester; polyanhydride; poly(glycolic acid); poly(D,L-lactic acid); poly(glycolic acid-co-trimethylene carbonate); polyphosphoester; polyphosphoester urethane; poly(amino acids); cyanoacrylates; poly(trimethylene carbonate); poly(iminocarbonate); copoly(ether-esters) (e.g. PEO/PLA); polyalkylene oxalates; polyphosphazenes; biomolecules, such as fibrin, fibrinogen, cellulose, starch, collagen and hyaluronic acid; polyurethanes; silicones; polyesters; polyolefins; polyisobutylene and ethylene-alphaolefin copolymers; acrylic polymers and copolymers; vinyl halide polymers and copolymers, such as polyvinyl chloride; polyvinyl ethers, such as polyvinyl methyl ether; polyvinylidene halides, such as polyvinylidene fluoride and polyvinylidene chloride; polyacrylonitrile; polyvinyl ketones; polyvinyl aromatics, such as polystyrene; polyvinyl esters, such as polyvinyl acetate; copolymers of vinyl monomers with each other and olefins, such as ethylene-methyl methacrylate copolymers, acrylonitrile-styrene copolymers, ABS resins, and ethylene-vinyl acetate copolymers; polyamides, such as Nylon 66 and polycaprolactam; alkyd resins; polycarbonates; polyoxymethylenes; polyimides; polyethers; epoxy resins; polyurethanes; rayon; rayon-triacetate; cellulose; cellulose acetate; cellulose butyrate; cellulose acetate butyrate; cellophane; cellulose nitrate; cellulose propionate; cellulose ethers; and carboxymethyl cellulose. Examples of implantable devices for the present invention include self-expandable stents, balloon-expandable stents, stent-grafts, grafts (e.g., aortic grafts), vascular grafts, artificial heart valves, cerebrospinal fluid shunts, pacemaker electrodes, guidewires, ventricular assist devices, artificial hearts, cardiopulmonary by-pass circuits, blood oxygenators, and endocardial leads (e.g., FINELINE and ENDOTAK, available from Guidant Corporation, Santa Clara, Calif.). The underlying structure of the device can be of virtually any design. The device can be made of a metallic material or an alloy such as, but not limited to, cobalt chromium alloy (ELGILOY), stainless steel (316L), high nitrogen stainless steel, e.g., BIODUR 108, cobalt chrome alloy L-605, “MP35N,” “MP20N,” ELASTINITE (Nitinol), tantalum, nickel-titanium alloy, platinum-iridium alloy, gold, magnesium, or combinations thereof. “MP35N” and “MP20N” are trade names for alloys of cobalt, nickel, chromium, and molybdenum available from Standard Press Steel Co., Jenkintown, Pa. “MP35N” consists of 35% cobalt, 35% nickel, 20% chromium, and 10% molybdenum. “MP20N” consists of 50% cobalt, 20% nickel, 20% chromium, and 10% molybdenum. Devices made from bioabsorbable or biostable polymers could also be used with the embodiments of the present invention. wherein the polymer comprising an acidic moiety derived from at least one of straight chain aliphatic diacids having 2 to 20 carbon atoms. 3. The medical device of claim 2 wherein the alcoholic moiety is derived from a diol having from 1 to 25 carbon atoms or a saccharide. 4. The medical device of claim 3 wherein the alcoholic moiety is derived from a diol having 1 to 16 carbon atoms. 5. The medical device of claim 2 wherein the alcoholic moiety is derived from at least one of ethylene glycol, 1,2-propane diol, 1,3-propane diol, 1,4-butanediol, 1,5-butanediol, 1,6-hexanediol, 1,7-heptanediol, 1,8-octanediol, higher diols up to C16, glycerol, trimethylol propane, pentaerythritol, cyclohexanedimethanol, serinol, diethanolamine, or saccharides. 6. The medical device of claim 5 wherein saccharides are selected from erythrose, threose, ribose, arabinose, xylose, lyxose, dihydroxyacetone, erythrulose, xylulose, aldoses, or ketoses. 7. The medical device of claim 6 comprising at least three alcoholic moieties derived from an aliphatic diol, triol, or polyol. 8. The medical device of claim 2 wherein the acidic moiety is derived from at least one of oxalic acid, malonic acid, succinic acid, glutaric acid, adipic acid, pimelic acid, suberic acid, azaleic acid, sebacic acid, terephthalic acid, or malic acid. 9. The medical device of claim 2 wherein oligomeric diacids with anhydride bonds in the backbone are selected from poly(sebacic anhydride), poly(suberic anhydride), poly(adipic anhydride), poly(succinic anhydride), poly(maleic anhydride), poly(1,6-bis(p-phenoxy carboxy)hexane), poly(1,4-bis(p-phenoxy carboxy)butane), poly(1,3-bis(p-phenoxy carboxy)propane), and poly(1,4-dicarboxybenzene). 10. The medical device of claim 8 comprising at least two acidic moieties each derived from a different polycarboxylic acid. 11. The medical device of claim 2 wherein the biobeneficial moiety, the non-fouling moiety, or the bioactive moiety are selected such that they give rise to a released molecule that can pass through a mammalian kidney. 12. The medical device of claim 11 wherein the biobeneficial moiety, the non-fouling moiety, or the bioactive moiety are selected such that the released molecule has a molecular weight of less than or equal to 40,000 daltons. 13. The medical device of claim 2 wherein the biobeneficial moiety is at least one of the polypropylene glycol, block polymer surfactants of polyethylene glycol and polypropylene glycol, hydroxy functional poly(vinyl pyrrolidone), dextrin, sodium hyaluronate, heparin, elastin, chitosan, water-soluble derivatives of heparin, water-soluble derivatives of elastin, water-soluble derivatives of chitosan, tropoelastin, poly(2-hydroxyethyl methacrylate), hirudin, or sulfonated polystyrene. wherein L represents a crosslinking group or hydrogen. 19. The medical device of claim 17 wherein the first- and the second-block alcoholic constituents are independently derived from 1-to-50-carbon-atom molecules. 20. The medical device of claim 19 wherein the first- and the second-block alcoholic moieties are independently derived from 1-to-10-carbon-atom molecules. 21. The medical device of claim 17 wherein first- and second-block alcoholic moieties are independently derived from at least one of ethylene glycol, 1,2-propane diol, 1,3-propane diol, 1,4-butanediol, 1,5-butanediol, 1,6-hexanediol, 1,7-heptanediol, 1,8-octanediol, higher diols up to C16, glycerol, trimethylol propane, pentaerythritol, cyclohexanedimethanol, serinol, diethanolamine, or saccharides. 22. The medical device of claim 21 wherein saccharides are selected from erythrose, threose, ribose, arabinose, xylose, lyxose, dihydroxyacetone, erythrulose, xylulose, aldoses, or ketoses. 23. The medical device of claim 17 wherein the first- and second-block acidic moieties are independently derived from 1-to-50-carbon-atom molecules. 24. The medical device of claim 23 wherein the first- and the second-block acidic moieties are independently derived from 1-to-10-carbon-atom molecules. 25. The medical device of claim 17 wherein the first- and the second-block acidic moieties are independently derived from at least one of oxalic acid, malonic acid, succinic acid, glutaric acid, adipic acid, pimelic acid, suberic acid, azaleic acid, sebacic acid, terephthalic acid, malic acid, fumaric acid, citric acid, citramalic acid, tricarballylic acid, tartaric acid, isophthalic acid, phthalic acid, 1,6-bis(p-carboxy phenoxy)hexane, 1,3-bis(p-phenoxy carboxy)propane, 1,4-bis(p-phenoxy carboxy)butane, dodecanedioic acid, tetradecanedioic acid, hexadecanedioic acid, or oligomeric diacids with anhydride bonds in the backbone. 26. The medical device of claim 25 wherein oligomeric diacids with anhydride bonds in the backbone are selected from poly(sebacic anhydride), poly(suberic anhydride), poly(adipic anhydride), poly(succinic anhydride), poly(maleic anhydride), poly(1,6-bis(p-phenoxy carboxy)hexane), poly(1,4-bis(p-phenoxy carboxy)butane), poly(1,3-bis(p-phenoxy carboxy)propane), and poly(1,4-dicarboxybenzene). 27. The medical device of claim 17 wherein the biobeneficial molecule is at least one of the polypropylene glycol, block copolymer surfactants of polyethylene glycol and polypropylene glycol, hydroxy functional poly(vinyl pyrrolidone), dextrin, sodium hyaluronate, heparin, elastin, water-soluble derivatives of heparin, water-soluble derivatives of elastin, water-soluble derivatives of chitosan, tropoelastin, poly(2-hydroxyethyl methacrylate), hirudin, or sulfonated polystyrene. 29. The method of claim 28 wherein preparing a polymerizable biobeneficial moiety based on BB comprises connecting a biobeneficial moiety, BB, to a di-, tri-, or poly-ol based on W.
b) then copolymerizing a polycarboxylic acid based on Q′, a di-, tri-, or polyol based on W, and the product of a). 31. A composition comprising a first polymer blended with the polymer of claim 1. 32. The composition of claim 31 wherein the first polymer modulates biological outcome. 33. The composition of claim 31 wherein the first polymer comprises polycaprolactone, poly(D,L-lactide), poly(L-lactide), poly(D,L-lactide-co-L-lactide), poly(glycolide), poly(D,L-lactide-co-glycolide), poly(dioxanone), poly(4-hydroxybutyrate), poly(3-hydroxybutyrate), poly(3-hydroxy valerate), poly(hydroxybutyrate-co-hydroxyvalerate), poly(tyrosine derive carbonates), poly(tyrosine arylates), poly(imino carbonates), poly(trimethylene carbonate), poly(anhydrides), poly(orthoesters), or poly(ester amides). 34. The composition of claim 32 wherein the first polymer comprises polycaprolactone, poly(D,L-lactide), poly(L-lactide), poly(D,L-lactide-co-L-lactide), poly(glycolide), poly(D,L-lactide-co-glycolide), poly(dioxanone), poly(4-hydroxybutyrate), poly(3-hydroxybutyrate), poly(3-hydroxy valerate), poly(hydroxybutyrate-co-hydroxyvalerate), poly(tyrosine derive carbonates), poly(tyrosine arylates), poly(imino carbonates), poly(trimethylene carbonate), poly(anhydrides), poly(orthoesters), or poly(ester amides). wherein the polycarboxylic acid is selected from the acidic moiety is derived from at least one diacid selected from the group consisting of straight chain aliphatic diacids having 2 to 20 carbon atoms, terephthalic acid, fumaric acid, citric acid, citramalic acid, tricarballylic acid, tartaric acid, isophthalic acid, 1,6-bis(p-carboxy phenoxy)hexane, 1,3-bis(p-phenoxy carboxy)propane, 1,4-bis(p-phenoxy carboxy)butane, and oligomeric diacids with anhydride bonds in the backbone. wherein the first- or second-block acidic moieties are derived from at least one of straight chain aliphatic diacids having 2 to 20 carbon atoms. 40. 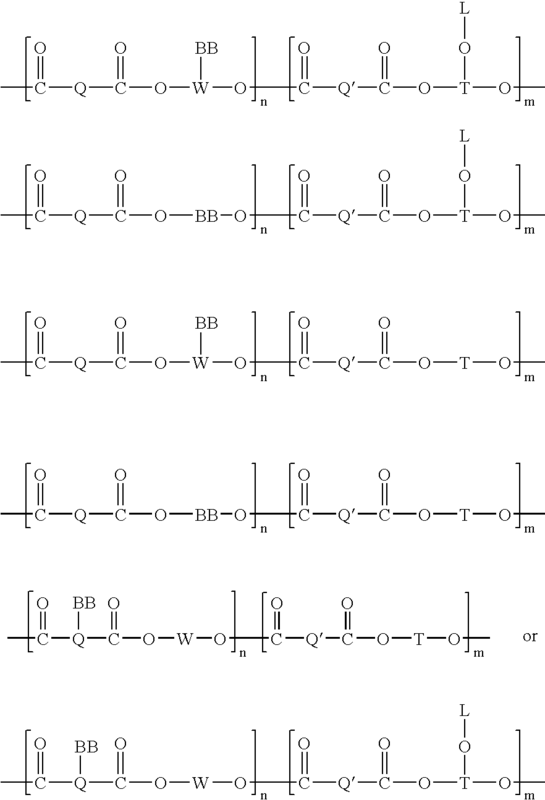 The copolymer of claim 39 wherein saccharides are selected from erythrose, threose, ribose, arabinose, xylose, lyxose, dihydroxyacetone, erythrulose, xylulose, aldoses, or ketoses. a biobeneficial moiety derived from polypropylene glycol, PLURONIC™ surfactants, block copolymers comprising polyethylene glycol and polypropylene glycol, hydroxy functional poly(vinyl pyrrolidone), dextrin, sodium hyaluronate, hyaluronic acid, elastin, water-soluble heparin, water-soluble elastin, tropoelastin, poly(2-hydroxyethyl methylmethacrylate), heparin, hirudin, sulfonated polystyrene, superoxide dismutase mimetics, anti-oxidants, or free radical scavengers. 42. The composition of claim 41 wherein the first polymer modulates biological outcome. Schmidt et al., Long-Term Implants of Parylene-C Coated Microelectrodes, Med & Biol Eng & Comp, 26(1):96-101 (1988). Sepulchre et al., "Water-soluble polymers bearing biologically active residues, 1". Macromolecular Chemistry and Physics 194, Apr. 1993 No. 4, pp. 1065-1077.